Prime Minister Nawaz Sharif on Thursday assured visiting British Foreign Secretary William Hague of his government’s full support for an Afghan-led and Afghan-owned peace process, stating that his close aide would be leaving for Kabul in the next few days to meet Afghan President Hamid Karzai in a bid to remove any misunderstandings and accelerate efforts to help restore the Doha peace process. Nawaz passed on the assurance during his meeting with the British foreign secretary who called on the PM with British high commissioner in Islamabad and other senior officials. Peace talks between Taliban and US officials had recently been stalled after a row over opening of Taliban office in Doha, Qatar, and hoisting the Taliban flag, a move strongly opposed by Karzai. The PM also told Hague that his government had opened back-channel contacts with neighbour India to improve bilateral relations. During the talks, the prime minister was assisted by Adviser on National Security and Foreign Affairs Sartaj Aziz, Special Assistant to the Prime Minister on Foreign Affairs Tariq Fatmi and Foreign Secretary Jalil Abbas Jilani. A source privy to the details of the meeting told Pakistan Today that the prime minister told Hague that Aziz would be leaving for Kabul on Saturday to meet Afghan President Hamid Karzai. “Secretary Hague urged the prime minister to remove mistrust with the Karzai government as cooperation of both Pakistan and Afghan government was a must to revive the dialogue process with the Taliban in Afghanistan to help pave the way for withdrawal of NATO forces from the violence-hit Afghanistan,” the source said, adding that the PM shared the concerns of visiting dignitary and said President Karzai would also be invited for a visit to Pakistan to help remove mistrust and revive cordial ties. The source added that Nawaz also took up the matter of police investigation against Mutahida Qaumi Movement (MQM) leader Altaf Hussain. “Hague told the PM that the matter was with the local police and the government would not interfere in the investigation process,” the source added. 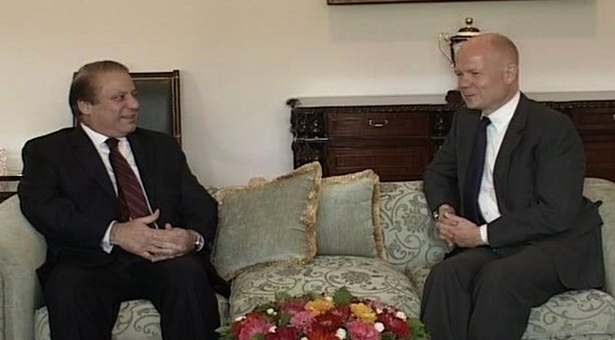 Hague expressed full support for all initiatives for peace with India and reaffirmed British friendship for Pakistan and Britain’s desire to contribute to Pakistan’s development and prosperity. The two leaders discussed the entire spectrum of bilateral relations and expressed satisfaction at the direction and trajectory of the relationship. They noted that the visit, last month, of Prime Minister David Cameron sent the right message for an enduring partnership between the two countries.